Those who have had the pleasure of experiencing Hanno Pöschl on TV, in the movies, or on stage, will surely remember the charismatic man from Vienna. The actor Pöschl has worked in numerous films, television series, and theater productions as an unmistakable embodiment of the archetypical “Homo Austriacus.” He has frequently played a grumpy urbanite or shady lowlife – supposedly superficial roles, which in his case, however, turn out to be complex characters when taking a closer look. And finally, the aura of his roles, embodied with an ever-present verve and emphatic nonchalance, brought Pöschl from Vienna to the world’s cinemas. In its Spotlight on series, the Diagonale’19 is devoting a film program to one of Austria’s most interesting and highly charismatic actors. And by following along the biography of Hanno Pöschl, also allows for reflection on the most recent history of Austrian cinema. Hanno Pöschl will be present at all screenings. The series will be complemented by an extensive Diagonale im Dialog following the screening of Querelle. Hanno Pöschl’s biography is just as fascinating and diverse as his acting engagements. Pöschl grew up in Vienna and after completing his apprenticeship as a confectioner, worked at a car wash, as an auto mechanic, a representative, an asphalt layer, candle maker, driver for a forwarding company, and at a vineyard. After attending the Lamberg-Offer acting school, he worked as an assistant director and performer in the Circus Roncalli. His acting career, on the other hand, began in the theater. Hanno Pöschl first had guest appearances in Vienna with the Ensemble Theater, at the Akademietheater, and also at the Schauspielhaus, where he then had a permanent engagement beginning in 1974. His distinctive acting ultimately led him to Vienna’s Burgtheater. After his performance in the role of the Fiscur in Ferenc Molnár’s Liliom in 1992, he became a permanent member of the ensemble under Claus Peymann. In the course of his theater career, it was the collaboration with greats such as Hans Gratzer, George Tabori, and Frank Castorf, that increasingly solidified Pöschl’s reputation as an experienced actor. The film adaptation of one of the most famous Austrian theater plays marked Hanno Pöschl’s entry into the world of film in 1979. His role alongside Helmut Qualtinger and Birgit Doll in Maximilian Schell’s Geschichten aus dem Wiener Wald (AT 1979) based on Ödön von Horváth lay the cornerstone for a long career in film. 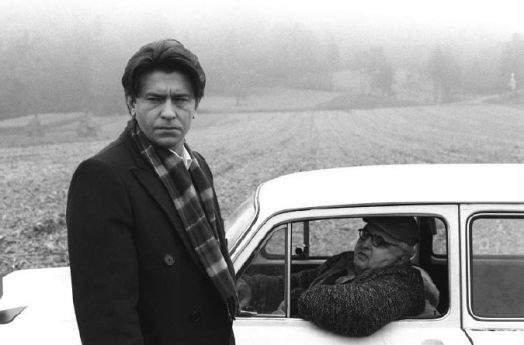 In 1980, Pöschl could be seen together with Paulus Manker in Franz Novotny’s film Exit … Nur keine Panik (AT/BRD 1980). An equally legendary and controversial milestone of the then young, so-called new Austrian film. As a result, Pöschl’s film career took off further. He thus appeared in numerous German-language film and television productions – often with his devilish grin and a charisma that rarely lacked a typical Viennese duplicity. Roles in Kir Royal, Ein Fall für zwei, Der Alte, Derrick, Kaisermühlen Blues, and last but not least, Kottan ermittelt: Der Geburtstag (Folge 2) (D: Peter Patzak, AT 1977) and also in Die Industrie entlässt ihre Kinder (D: Claus Homschak, AT 1976) made Pöschl one of the most well-known television faces of the 1980s. Prominent as an undisputed climax in the dense oeuvre of Hanno Pöschl is the collaboration with the exceptional German director Rainer Werner Fassbinder shortly before Fassbinder’s premature death: In 1982, Pöschl was part of the cast for Fassbinder’s final feature film Querelle (BRD/FR 1982), during the production of which he is meant to have once again met Roger Fritz. Already 1981, Hanno Pöschl acted in Roger Fritz’s Film Frankfurt Kaiserstraße. Here again, Pöschl acted in a shady milieu, in a role that, more than ever before, was considerably more complex than visible at first glance. A role with dissident, subversive, and queer potential – albeit in an entirely different tonality than in Fassbinder’s masterpiece Querelle. When Fassbinder’s cameraman Xaver Schwarzenberger celebrated his directing debut in 1983 with the filming of Gerhard Roth’s novel Der Stille Ozean (AT/BRD 1983), Pöschl had the chance to present his broad acting repertoire in a much more serious, introverted role without having to forgo his distinctive gestures. In the 1990s, Pöschl appeared in the role of the mechanic Max in the television series Medicopter 117. Pöschl’s acting, with its remarkable earnest, and simultaneous lightness, allowed him to master even such low-threshold formats. His ability to make milieus, and also an entire world tangible by means of minimal gestures and in extremely brief appearances, also fascinated the world cinema: A guest appearance in James Bond 007 – The Living Daylights was followed by one in 1995 in Richard Linklater’s legendary film shot in Vienna, Before Sunrise, which would make the city and its unmistakable characters popular far beyond the borders. Before withdrawing from acting, Pöschl connected with his great cinema roles one final time in 2008 in Götz Spielmann’s Oscar nominee film Revanche (AT 2008). Ever since, other than a short intermezzo on the satirical television series BÖsterreich, the inimitable Pöschl has rarely appeared on the movie screen or television. Hanno Pöschl has always had an uncompromisingly (self-)critical and refreshing relationship to the branch and to his artistic oeuvre. That might have something to do with the fact that he has always had a business on the side. 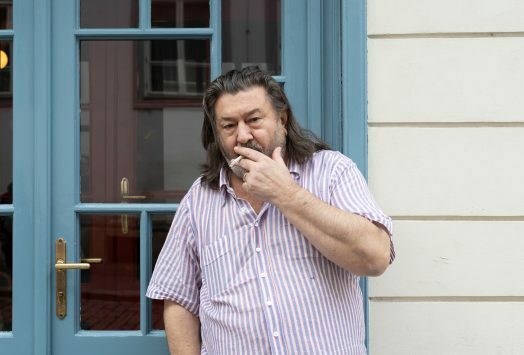 As a restaurant proprietor, he has created a legendary gathering place, his Kleines Café at Franziskanerplatz, which he continues to run today. Hanno Pöschl is celebrating his 70th birthday in 2019. Listening to him talk about his checkered and moving career is far more than a mere succession of anecdotes. Several decades of Austrian and international film and cinema history come alive and become tangible in all their facets and contradictions. With great pleasure, the Diagonale awaits an eye-opening and buoyant journey through the oeuvre of the actor Hanno Pöschl. The film program Spotlight on: Hanno Pöschl is complementary and supplementary to the historical special program On-Images: Projected Femininity(ies). — Querelle (D: Rainer Werner Fassbinder, BRD/FR 1982) – followed by Diagonale im Dialog with Claus Philipp.